This awesome autumn season isn't over yet, but it never hurts to venture outside the pumpkin patch once in a while to see what other goodies are out there in TJ's land. But don't worry, the 73% of you that love pumpkin won't be disappointed. Stay tuned for more pumpkintasticality next month! I just had to try this harvest blend because I've been looking for a nice caffeine-free way to wind down at night. 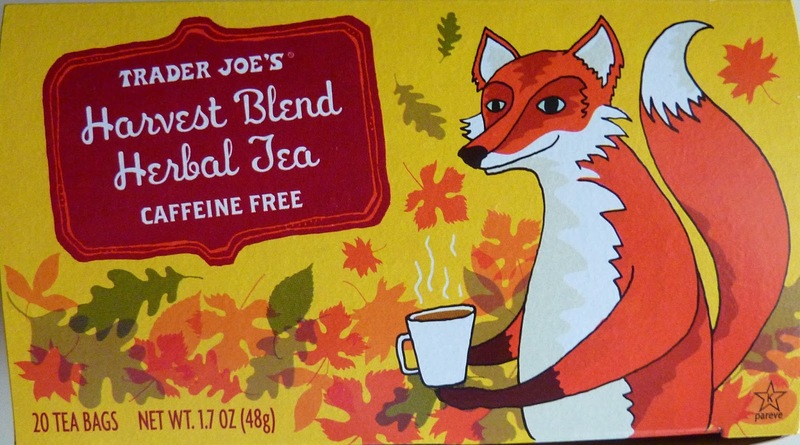 Plus, whenever you see an animal on a Trader Joe's brand box of tea, you know you're in for a treat. I'm thinking elephants, lemurs, and now foxes. This beverage is almost like a subtle cinnamon cider mixed with chamomile tea. And it actually has apple in the ingredients! Like an apple cider, it works both hot or iced, although I think you get more of that soothing chamomile effect when it's nice and steamy. Perfect for those long, dark late autumn nights—which reminds me, don't forget to "fall back" this weekend, folks! The flavors are balanced beautifully, with a calm core of chamomile rounded out by flavors like ginger, hibiscus, chicory, and orange peel. 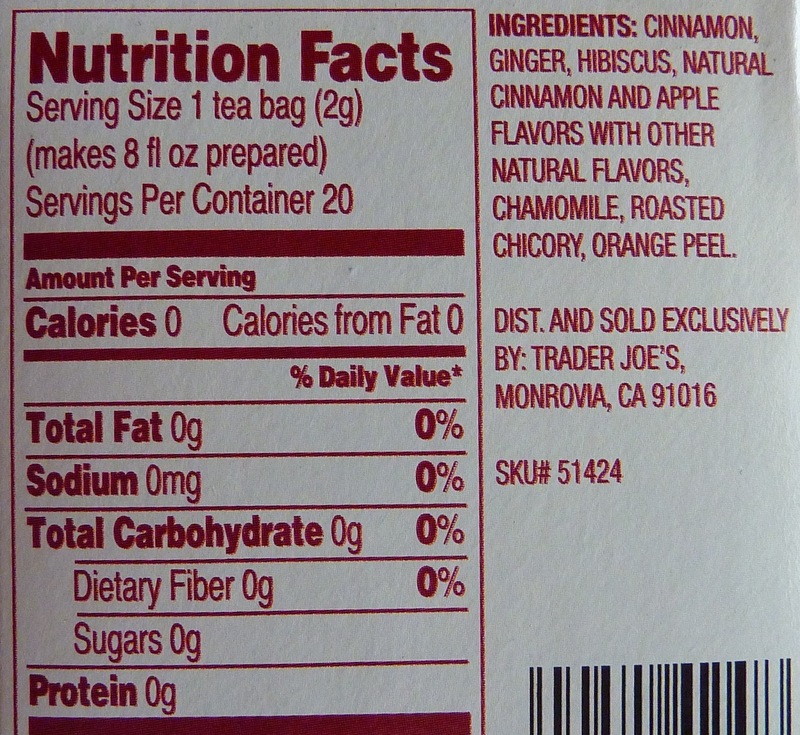 The cinnamon isn't overbearing, and believe it or not, you can totally taste that aforementioned apple. I've never heard of such a thing before. Apple in tea. It's an understated essence, but it lends a nice hint of faint fruitiness to an otherwise herbal aroma. Sonia and I both like it, and I must confess, I'm not the biggest fan of chamomile. But in this context, it's absolutely welcome. This is a very relaxing, delicious tea. Have a hit of the Harvest for homely hibernation. It's a four and a four for the fabulous Mr. Fox. This tea is great! I bought this Harvest Blend when they were out of the Pumpkin Spice tea, and I have not been disappointed! The only thing I would say is it is slightly sweeter than maybe I would prefer. Oh...they were out of the pumpkin spice chai? Yeah, you definitely don't need to add sugar to this one! I am drinking a cup right now in a colder than I am ready for Philadelphia. Half the treat of this tea is the aroma. It smells as great as it tastes. Great point about the smell of the tea. It's like aroma therapy before you even take a sip! I bought this tea last year around this time and loved it so much I ran back to get more...they were out. It is seasonal...so I stocked up and that way I will have it year round. Great aroma and it's delish.